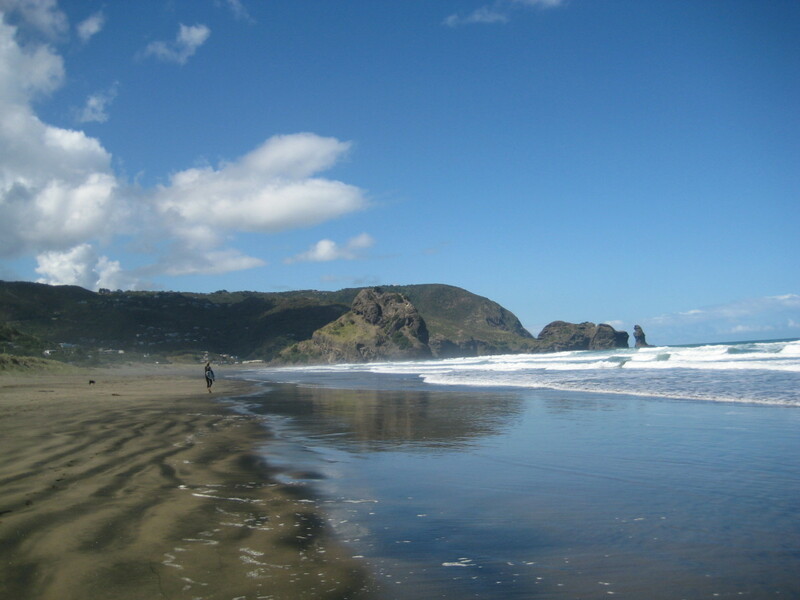 It was a remarkable walk down the Piha Beach! A day to remember. In so many ways. Good and bad. My phone alarm started to ring and I happily woke up. 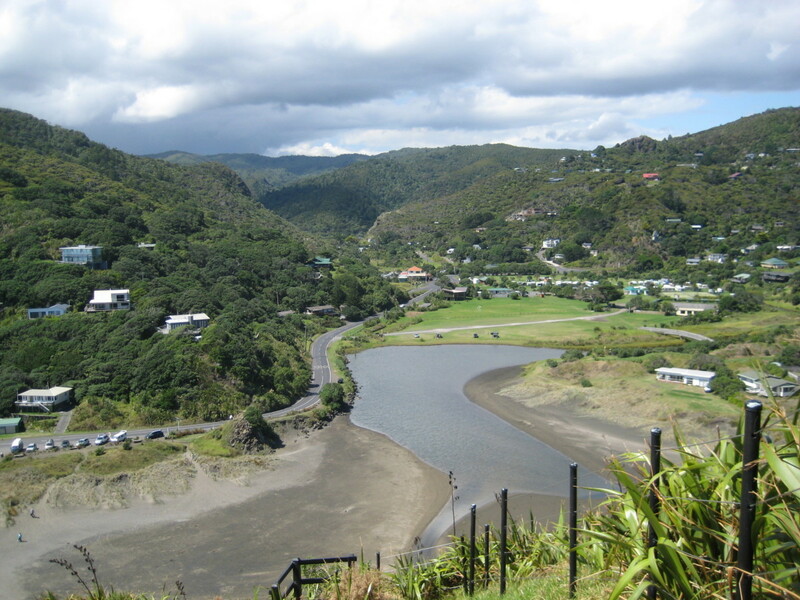 Here it was: a day I waited for after several days of research, studying and writing for my diploma about Waitakere, the New Zealand's sustainable city. Finally, a day to really relax and do nothing. I was in a hostel Surf'n'Snow Backpackers in Auckland, waiting for the Piha Surf Shuttle to pick me up and drive me to surfers paradise. 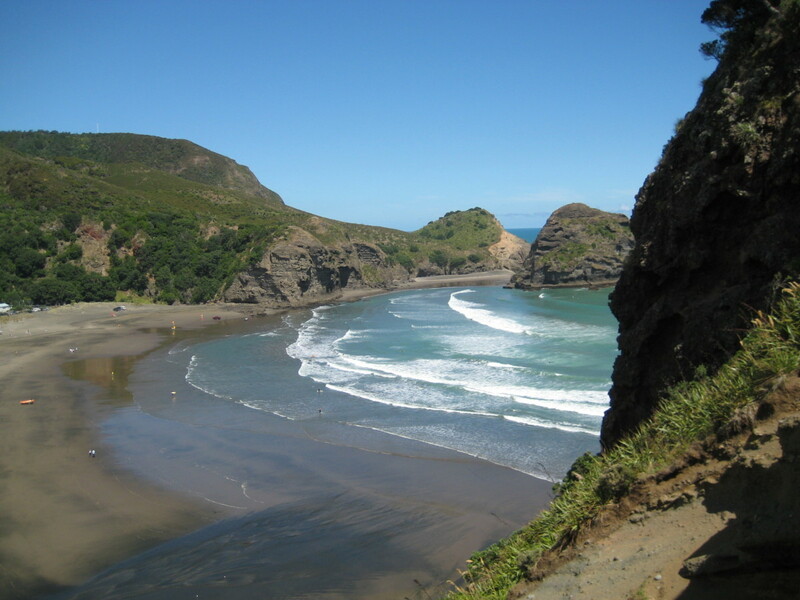 Where is Piha Beach located? 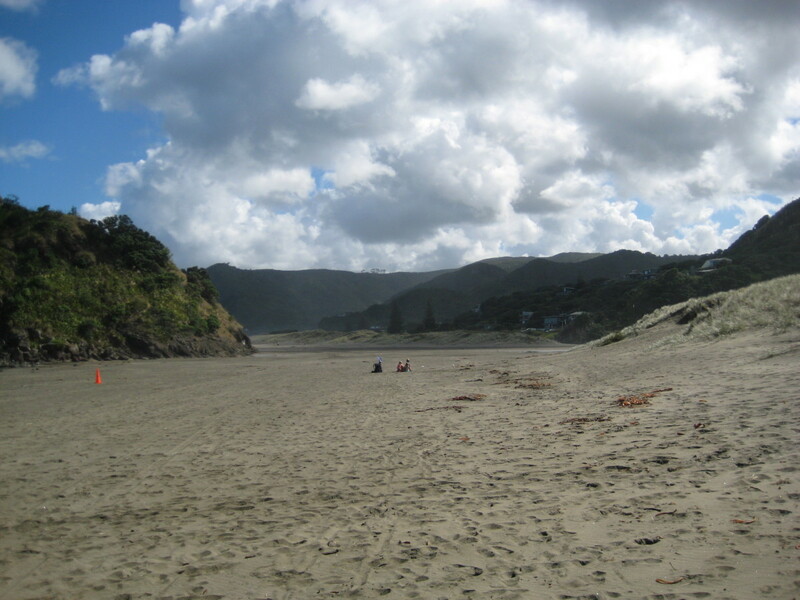 Piha Beach is situated on the west coast of North Island, 40 km from Auckland. 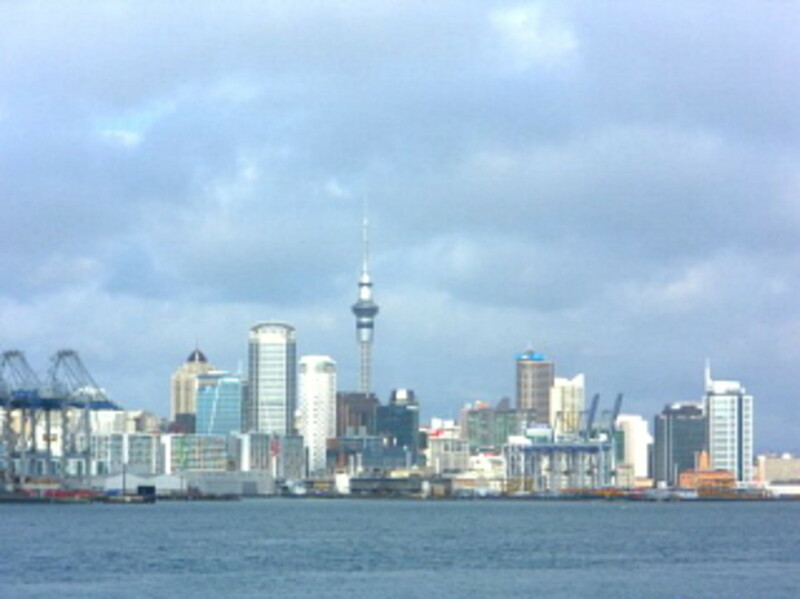 So it's less than and hour away from Auckland and as such favorite spot for Aucklanders who love the wild nature. 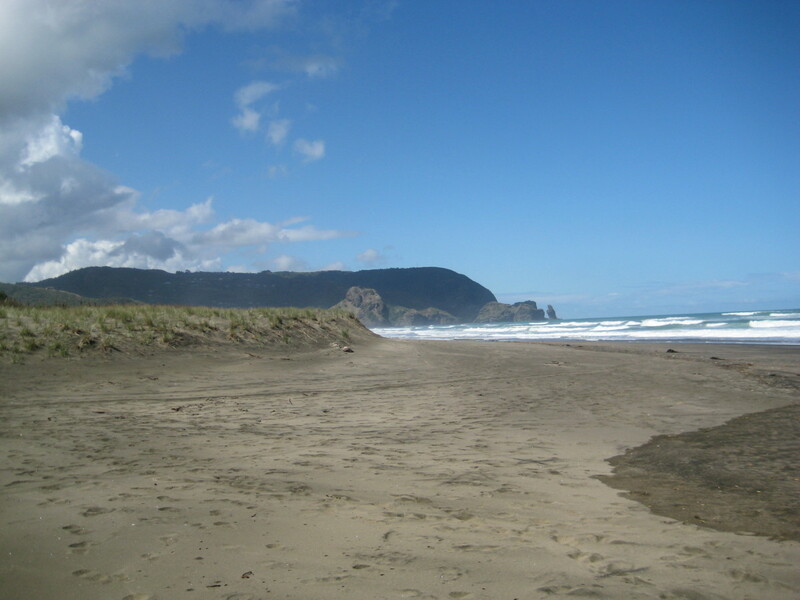 This black sand beach in one of the well-known New Zealand's beaches and probably New Zealand's most famous surf beach. 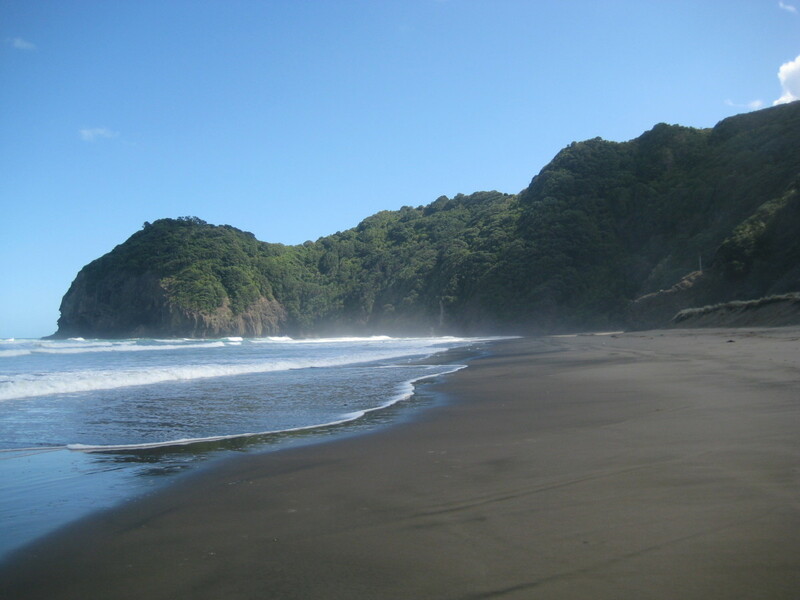 The black sand of the beach is dancing a wild dance with the waves of the Tasman Sea. 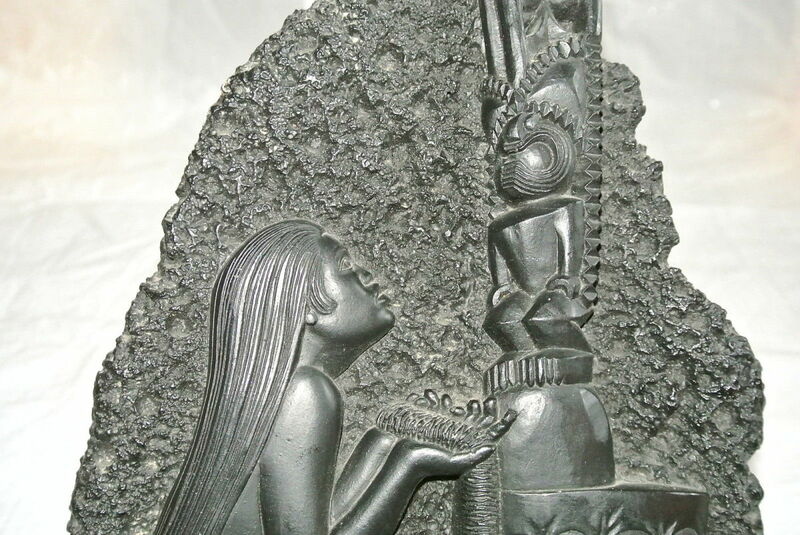 On the East, this intimate pair is guarded by the mighty Waitakere Ranges, protected parkland. The driver came on time. I was the last passenger, there were already a boy and a girl in the shuttle. The drive was pleasant, we talked, laughed, but most of all I was just staring through the car window and admiring the scenery. The driver gave me a few tips. Tips that I will never forget. Why? Because I didn't take them into account. He told me to buy a suncream and when the sun is high hide in the forest and go for a walk to the Kite Kite Falls. After about 40-50 minutes of driving, there we were, on the parking. Hurray! Let my lazy day begin! The landscape was really dramatic, so picturesque. I just wanted to stand alone and observe. Observe every millimeter. Observe all that my eyes can catch. Breathe. Just breathe and watch. And listen. And feel. Feel the beauty with all my senses. All I needed to do was take my shoes off. So off they went. I waved the driver and off I went too. In the distance, I heard him:' Hide from the sun!' But I didn't really listen. So, there I was. 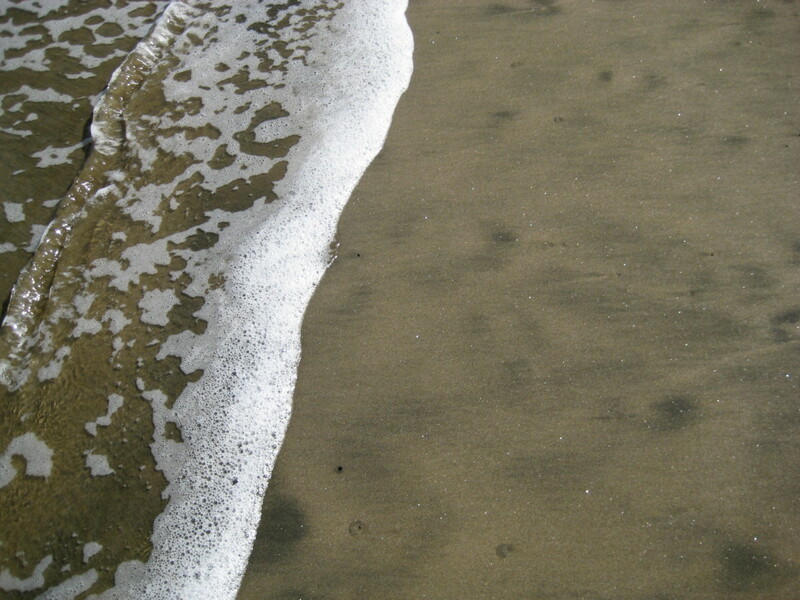 I ran to the black sand of the beach and how great that felt. So I just kept running and running. I needed to relax, I needed to refill, to push back stress and just be. Just be there, present in the moment. I watched the black sand, the sea, the sky and clouds, trees and forest. I picked up the sand and let it slip through my fingers. Black sand. And why black? 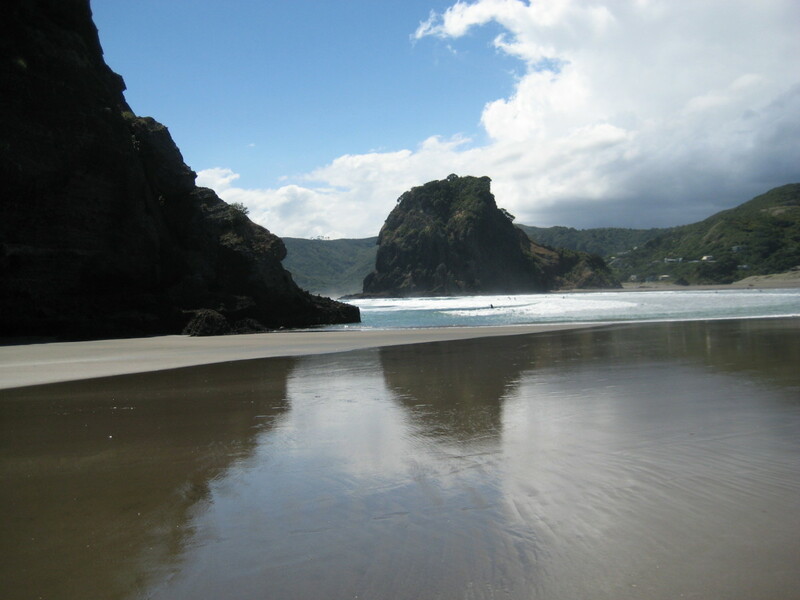 New Zealand is volcanic land and when the volcanic sand meets iron oxide, black sand beaches are made. 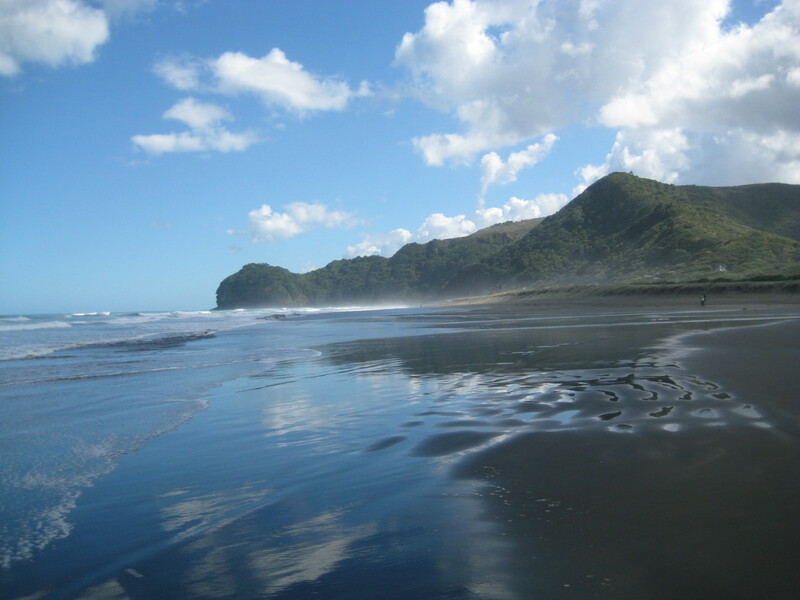 Have you heard of the black sand beach before? After a while, I sat on the sand calmly observing what was going on around me. It was fascinating. Like the nature that surrounded me, people were also interesting. First, there were surfers. What the control of body and mind! And courage. And most of all, mindfulness, they were right there, riding waves in such a harmony that was really a beauty to watch. The second thing that I've found great were families and friends having picnic time on the beach. It was so sweet and nice and cool. People brought their towels, little tents to hide from the sun, food and they had a great time walking, running, playing games, talking and resting. All had such an awesome time, leisure time, they really knew how to relax and enjoy. It slowly became a little too passive to just sit and observe, so I got up to go for a little walk. 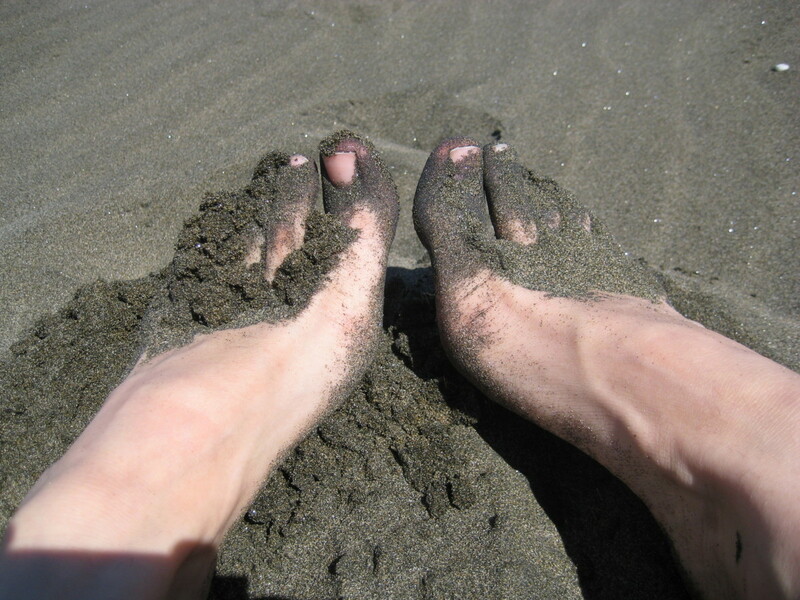 Oh wow, sand was hot, so it wasn't so pleasant anymore to walk barefoot, but I said to myself that I will continue a little bit. So I walked toward the Lion Rock. 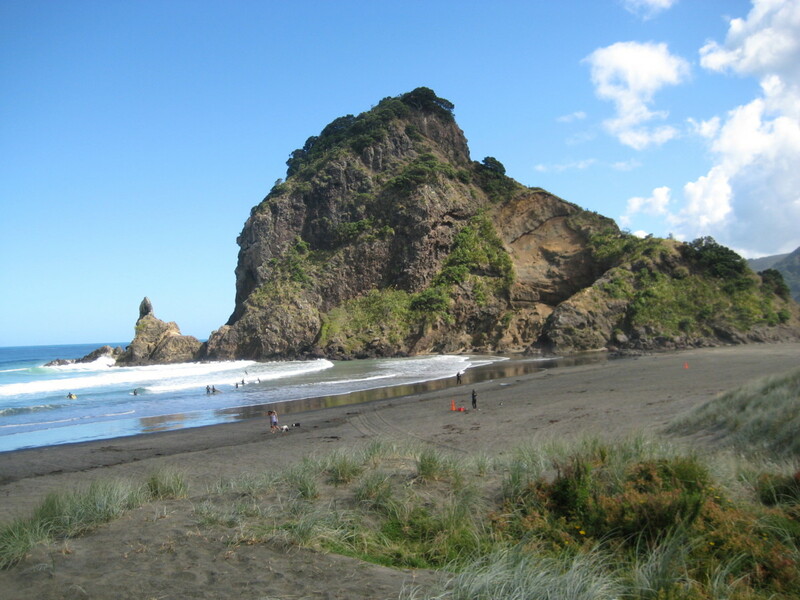 Lion Rock is Piha's most recognizable landmark. 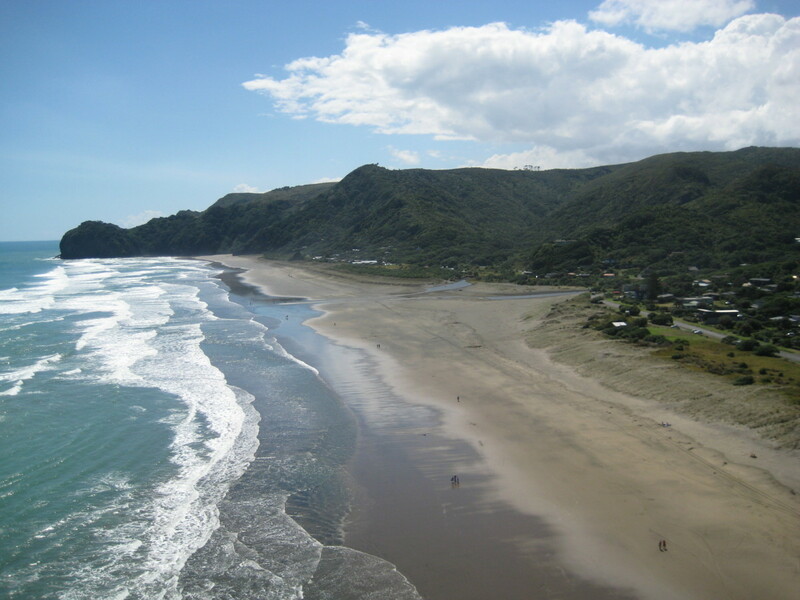 It divides Piha and North Piha beaches. I put on my shoes on and climbed up to the sign for a danger. The view was fantastic! And on the way up there was also a pole (pou). 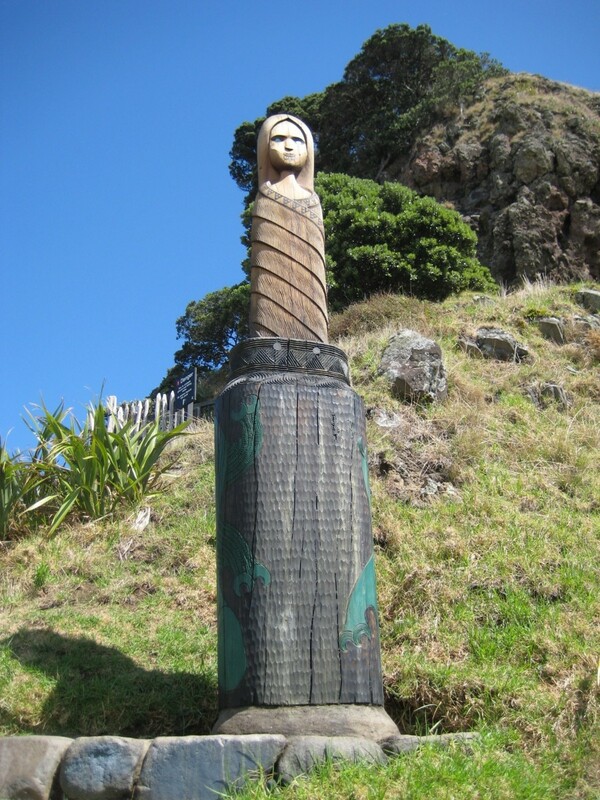 The pou is dedicated to the memory of Ngati Tangiaro Taua, probably the Maori princess, who loved to sit up there. 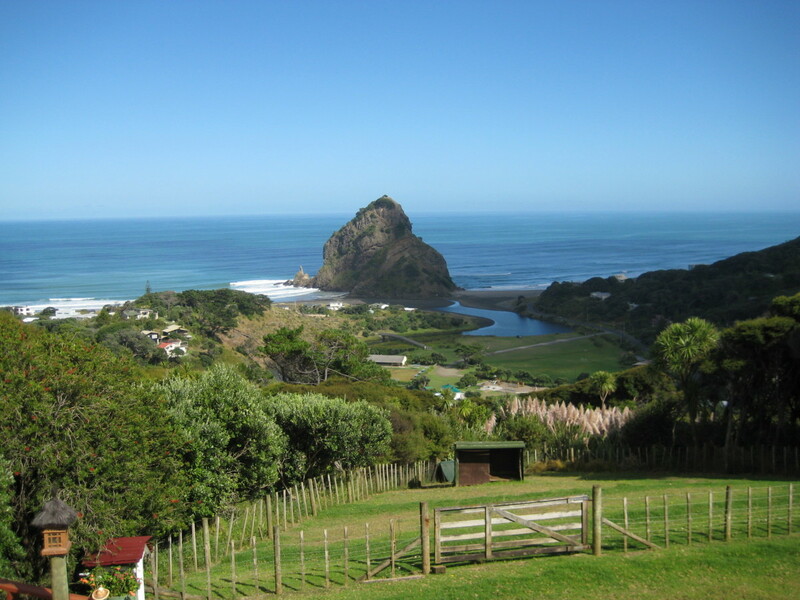 Geologically, Lion Rock is the eroded neck of a volcano which erupted 16 million years ago. I sat for a while on the Lion Rock, soaked up the sun and the beauty around me. It was so peaceful. So wild, but so peaceful. I was calm, soothed and relaxed. 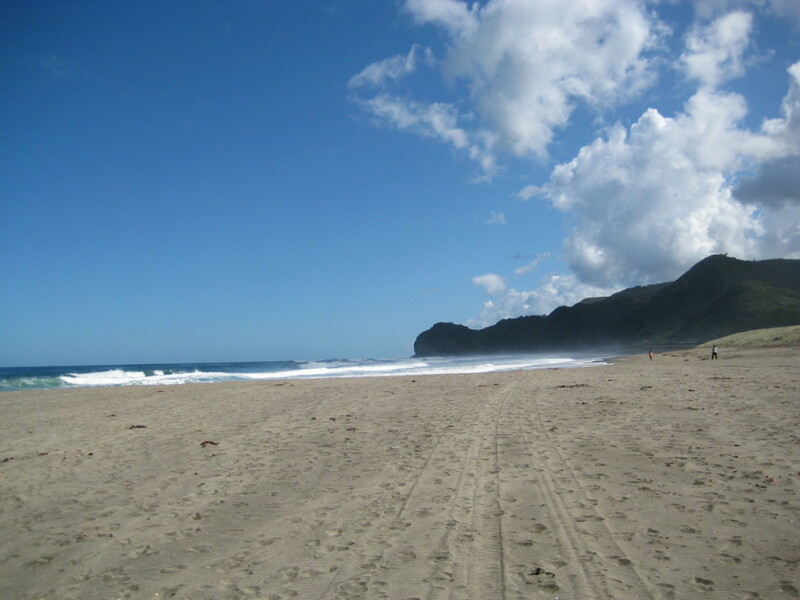 But it was time to move on, I wanted to walk on the sand to the edge of the North Piha Beach (Waitetura). The weather was pleasant, the wind was blowing, the heat was not so strongly felt. "Why did the driver told me to hide from the high sun and go in the forest? 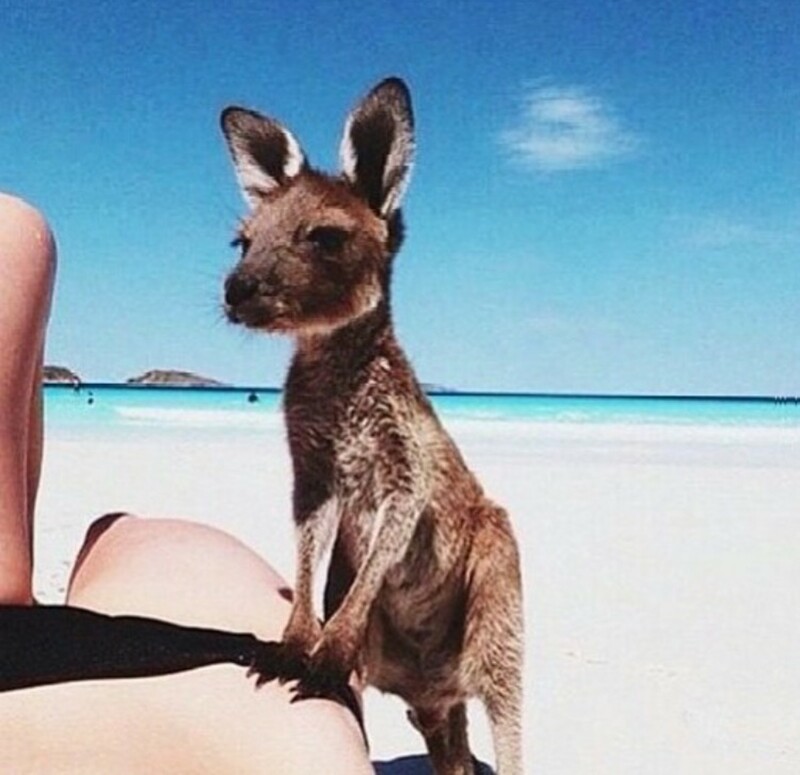 Why would I do that, it's so nice here, warm and pleasing". I took of my shoes again and went walking in the water. Oh wow, that was something! Happy and sad at the same time because I forgot my swimwear. And anyway I did not see anybody swimming. I guessed it is not so save afterall, so I kept amusing myself by happily jumping and splashing the water around. Another thing that caught my eye was low tide and how big the difference between low and high tide can be. Changing tides impressed me some days ago when I was observing Cheltenham Beach in Devonport, Auckland. I have never seen something like that before. Glorious sea when high tide and when the tide was low, a remarkable landscape for enthusiastic walkers, dreamers. 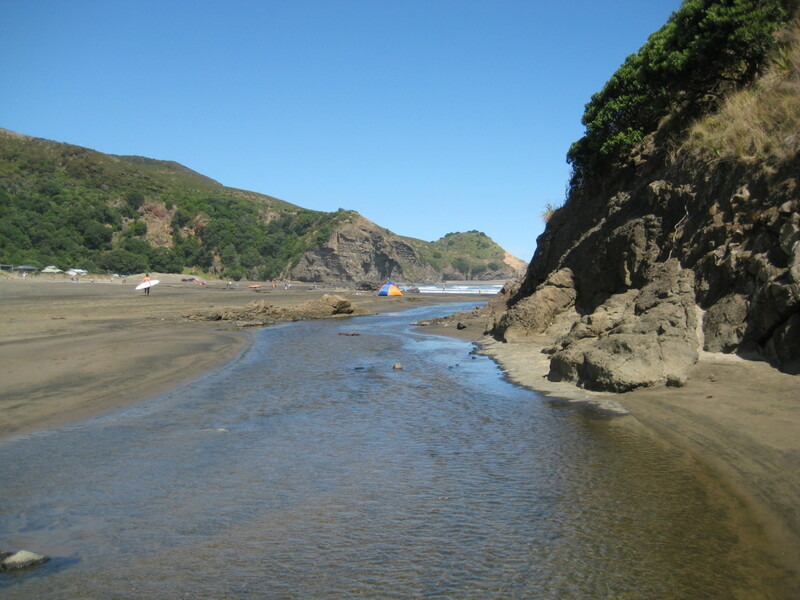 Low and high tide on Piha was special also. I walked in all the places where water was before. I felt like some kind od researcher. Well, I know how to entertain myself. Yes, a lot of things! First of all: never be too lazy while exploring! 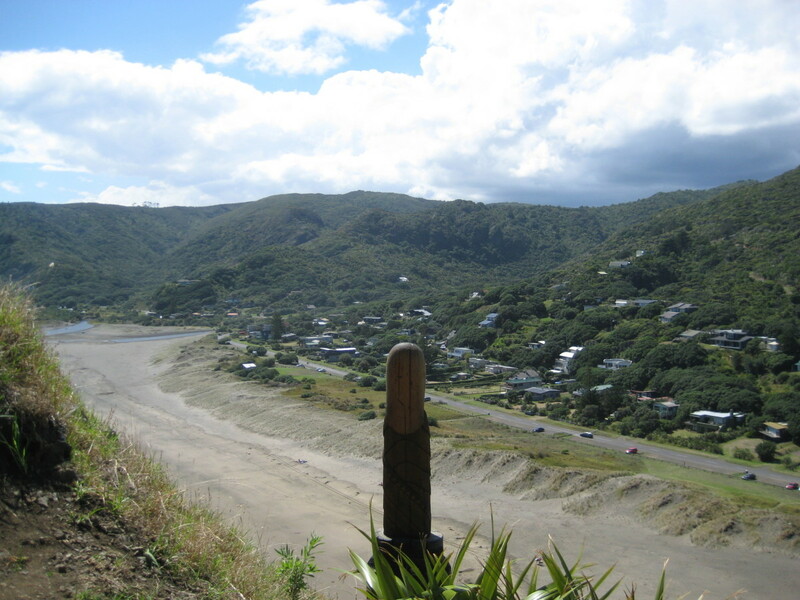 Piha offers much more that I have seen. I was overwhelmed by the sea, the beach, the Lion Rock, the view, that I spent all day wandering around, observing, absorbing. 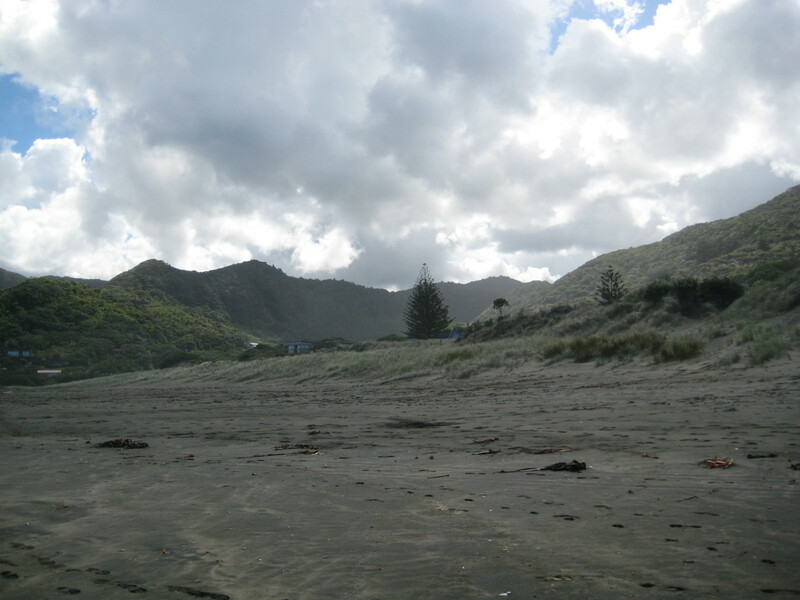 I was so focused on the beach that I totally forgot about the Waitakere Ranges. The forest. 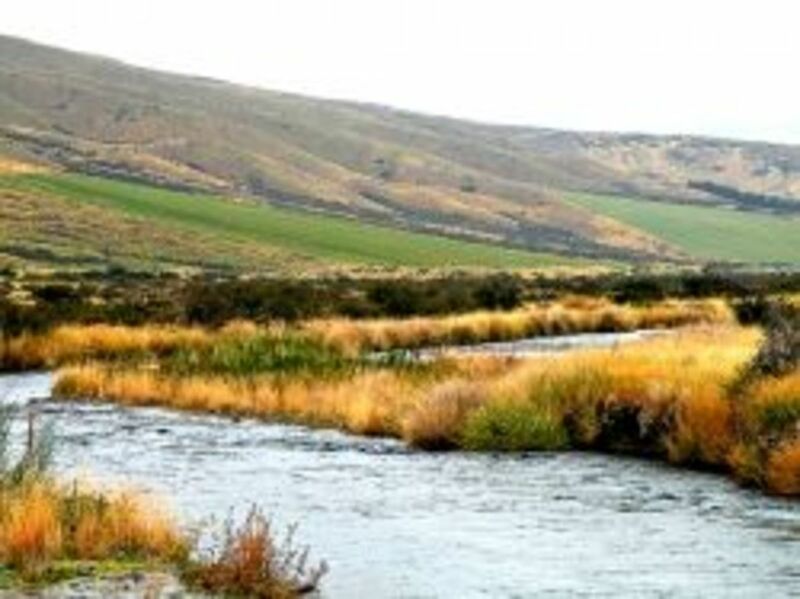 And what did the driver told me - go see the Kite Kite Falls. Oh, what I've missed! And the second recognition: trust the local! You are never smarter than the local people. What did the driver tell me? Hide from the sun. In some point it even made me laugh. Why should I hide? It's not even close to hot. Well, it was. I got painful burns. I couldn't even sleep at night it was so painful. Walking next day in the streets of Auckland was hell. My ankles were swollen, my face was hurting, red and peeling ten times a day. But well, I have learned my lesson. And it was really a remarkable day! Enjoy the view and the music! Such beautiful photos! I love the drone videos, too. 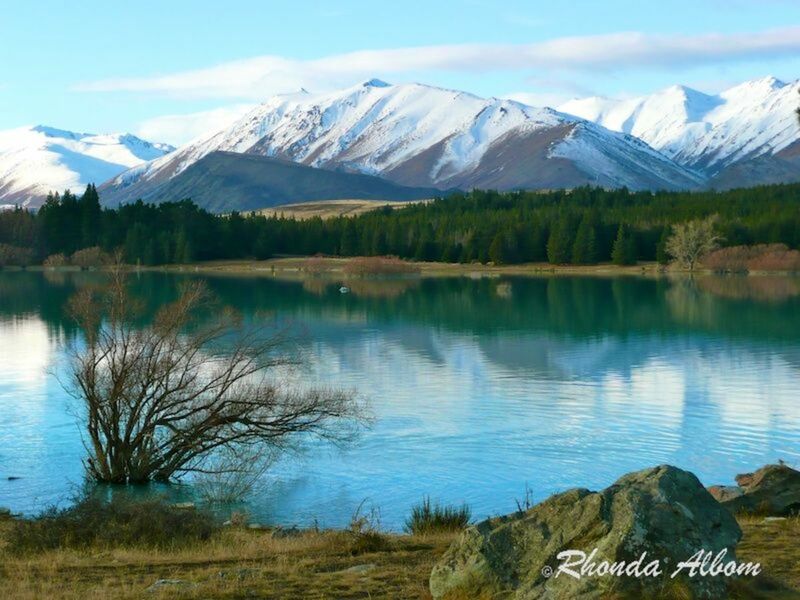 I have relatives in New Zealand. 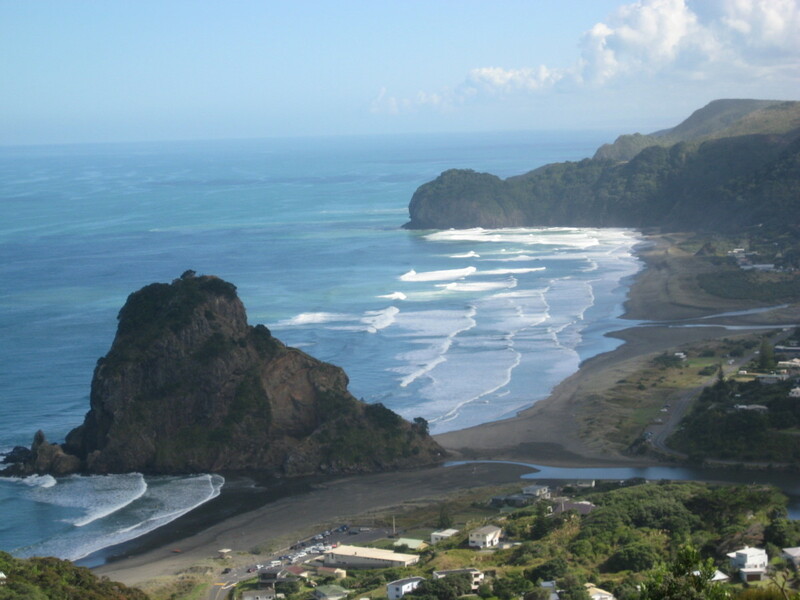 I'd love to visit them and the country, including Piha Beach. Thank you for a lovely hub.